Yup, Jane Norman you guys. No longer are they just associated with those tote bags everyone had in school when I was younger, as they’re now throwing out some seriously stylish pieces ready for a bit of a revival of the brand this year! I’ve been having a browse of the site and they’ve done well to cover the basics. I mean, of course there’s the skin tight dresses and tops that Jane Norman are known for, but their chunky jumpers, fur coats and chic accessories have really struck a fashion chord with me. 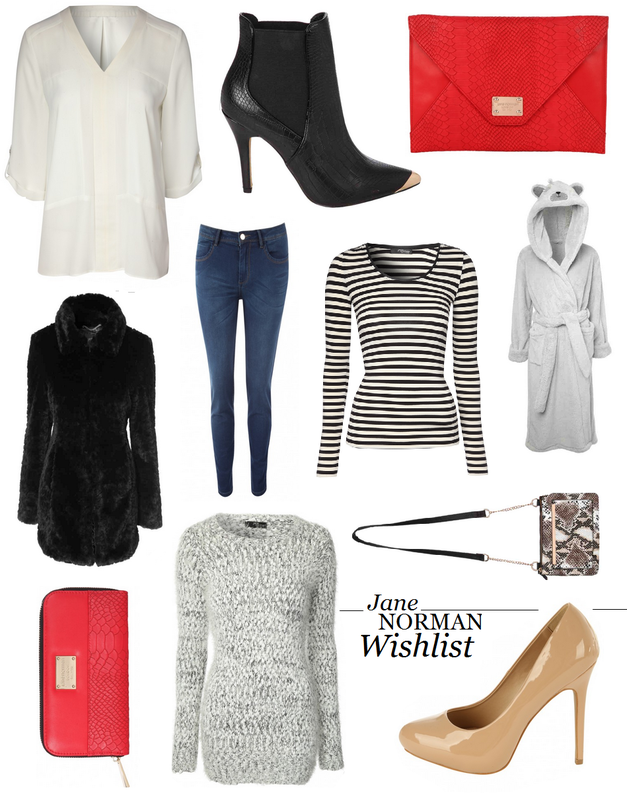 Standout pieces from the wishlist above have to be those boots with the cool metal toe, the fuzzy bear dressing gown (how cute!) and the snake print over-body bag. They’re all super reasonably priced too, which is a bonus and there’s a great variety of things on the site. Be sure to check them out and give a well loved and well established brand a bit of attention during your online shopping hunt! You never know, you may find exactly what your wardrobe is missing.